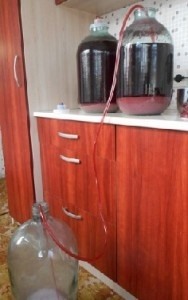 I am making home made wine for few years now mainly from apples + berries, grapes, pumpkin and etc. Recently, I have found a grate and detailed recipe ( at http://www.moonshiners.club/ )of grape wine and want to share it because the result is amazing! Before you start making wine, you should take care of all of the required containers. They must be squeaky clean and dry. Otherwise, some external fungi might contaminate the beverage and spoil its taste. Barrels, bottles, buckets, and other containers can be smoked with sulfur (the industrial way) or simply washed with boiled water and wiped with a dry cloth. I strongly encourage you not to use containers which used to contain milk, because a thorough wash might not help. In order to preserve wild yeasts on grapes you should pick them only in a dry sunny weather. There should be no rain 2-3 days prior to that. Only ripe fruits are good for winemaking. Unripe grapes contain too much acid which deteriorated the taste of the final beverage. Overripe berries are prone to develop vinegary fermentation which can eventually spoil all of the must (squeezed out juice). I also don't recommend picking up fruit drops, because they might add an unpleasant earthy taste to the grape wine, which is very hard to fix. 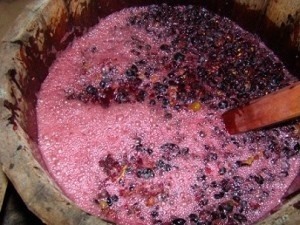 Harvested berries should be processed within two days, after that they will become unfit for making homemade wine. Harvested grapes are thoroughly sorted out, removing stems, unripe, tainted or berries with mold. 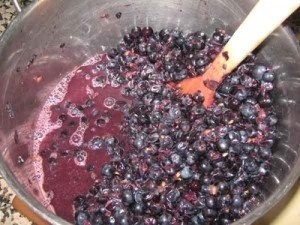 Then the berries are mashed and together with the juice are placed in an enamel pot, filling it up to ¾ of its volume. It is best to mash the grapes by hands, thus not damaging the seeds, which contain substances that make the taste of wine bitter. If there are too many berries, then you should gently shuffle them with a wooden rolling pin (pestle). You should avoid letting the juice touch metal (unless it's stainless steel), because this causes oxidation, which spoils the taste of homemade wine. That's why berries should be mashed by hands or with wooden tools, and put the pulp (mashed grapes) into an enamel hollow-ware – a bucket or a pan. You can also use food grade plastic ware or a wooden barrel. Then cover the container with a clean cloth and leave for 3-4 days in a dark warm place (65-74F° / 18-23°C). After 12-20 hours the juice will start fermenting, and on its surface "a hat" from peels will appear, which must be removed 1-2 times a day by stirring the pulp with a wooden spoon or by hand. If you don't do that, the mash might start vinegary fermentation which will spoil your wine material. After 3-4 days the pulp will get brighter, it will obtain sour scent and you'll hear a hissing sound. This means that the fermentation has successfully started; it's time to squeeze the juice out. The upper layer of peel is gathered in a separate container and squeezed with a press or by hands. All of the juice (should be separated from the sediment of the pulp) is filtered through gauze and transferred 2-3 times from one container into another. This transferring allows not only to get rid of impurities but also enriches the juice with oxygen, facilitating proper operation of wine yeasts. Then fermentation containers get filled with pure juice (up to 70% of their volume). Ideally glass containers should be used. 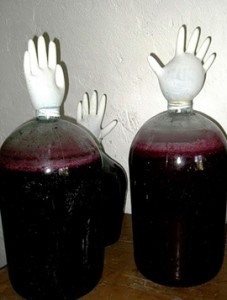 In order to prevent your homemade grape wine from souring, you should secure it against air-influx and provide an outlet for the main fermentation product – carbon dioxide. This can be achieved by installing one of the designs of a water lock on top of the juice container. 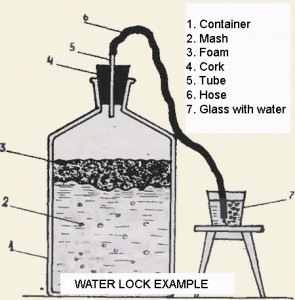 The most popular one is a classic water lock consisting of a lid, a tube, and a jar (as can be seen on the photo). A simple medical glove with a hole in one of the fingers proved to serve well at home too. The design of a water lock is not critical, but installing classic water lock on bigger containers is much more convenient. Using gloves is good for smaller containers. After installing a water lock you should provide suitable temperature conditions for the containers. Optimal temperature of red homemade wine fermentation is 72-83F° / 22-28°C, of white wine – 60-72F° / 16-22°C. You shouldn't allow temperature to drop below 50F° / 10°C, otherwise there's a chance of yeasts dying before turning all of the sugar into alcohol. Due to various reasons after 2-3 days the must might stop fermenting. Since you can't add distillers yeast, in order to restart the fermentation you have to make a wine broth. The simplest recipe is: put 5.3 oz / 150 grams of raisins into the bottle, 1.7 oz / 50 grams of sugar and add warm water up to 1/3 of the volume. Close the bottle with a cotton cork and leave it for 3-4 days in a warm place. When raisins start fermenting (bubbles will appear), you should pour out the broth, mix it with1 liter of the must and put it back to the wine container. That will restart the fermentation. Approximately 2% of sugar in the must give 1% of alcohol in the matured wine. In most of the regions sugar content of grapes does not exceed 20%. This means that without adding sugar you'll end up with wine with ABV of 10-12%. The maximum strength of beverages is 15-16% because higher content of alcohol kills wild yeasts. The problem resides in the fact that determining the initial sugar content of grapes in home conditions without a special device (hydrometer) is impossible. Focusing on the average grades is also useless, because it requires having information about the sugar content of the selected variety in its climatic zone. In non-winemaking areas nobody does such calculations. Therefore, we will focus on the taste of the juice. For maintaining normal fermentation sugar content of the must should not exceed 10-15%. In order to maintain this condition sugar is added by parts. After 2-3 days the fermentation has started taste the grape must. When it's getting sour (sugar transformed) you should add 50 grams of sugar per liter of the juice. For this pour 0.25-0.5 gal / 1-2 liters of the must into a separate container, dissolve sugar in it, pour the obtained wine syrup back into the bottle and shake it well. This procedure is repeated several times (usually 3-4) during the first 14-30 days of the fermentation. At certain point sugar content of the must will stop decreasing. This means that boiling fermentation has stopped and it's time to go to the next stage. When the water lock stops bubbling for 1-2 days (the glove deflates) and the must got brighter and formed loose sediment at the bottom, the new homemade wine is poured into another container. The deal is that dead fungi are gathering at the bottom. If they stay in wine for too long, they will give it a bitter taste and a bad smell. 1-2 days prior to removing wine from the sediment the fermentation container is put above the floor (1.5-2 ft / 50-60 cm). You can put it on a bench, a chair or anything else. When there's sediment at the bottom again, the wine should be poured into another container (dry and clean) through a siphon – a transparent soft tube 0.25-0.4 inches / 0.7-1 cm in diameter and 3.2-5 ft / 1-1.5 meters long. You should not get the end of the tube closer than 0.8-1 inch / 2-3 centimeters to the sediment. Poured homemade wine won't be absolutely transparent. You shouldn't be afraid of it, the appearance of the beverage has not yet settled. It's time to decide the sweetness of the new homemade wine. Since active fermentation has stopped added sugar will not transform and will stay in the beverage. You should add sugar to your own personal taste. At first pour 0.25-0.5 gal / 1-2 liters of wine, add sugar (not more than 3.5-7 oz / 100-200 grams per 0.25 gal / 1 liter) and then stir it, pour the wine with dissolved sugar back into the bottle and stir it again. If you're okay with the sweetness of the beverage then you can skip this step, just how you did with dry wine. This stage defines the final taste. It lasts for 40-380 days. Longer aging of homemade wines is pointless, since it doesn't improve beverages features. The bottle of wine is once again closed with a water lock (recommended) or tightly sealed with a lid. You should keep the container in a dark cellar or basement at a temperature of 50-61F° / 10-16°C. If it's impossible, then you should provide a temperature of 65-72F° / 18-22°C (but not higher) for the maturation of the new wine. It's important to avoid temperature drops; otherwise the taste will get worse. Minimum term of white wine aging is 40 days, of red wine – 60-90 days. You should transfer the wine from one container to another through a straw every 7-10 days, removing it from the sediment like we did at the 6th stage. As a result it will keep getting brighter and brighter. Simultaneously you control its taste. Even after several months in a basement homemade wine might still remain cloudy. If that's not okay with you, you can use techniques of wine clarification. The most popular one are gelatin fining or egg albumen fining. You should remember that clarification can improve only visual appearance of the beverage but not its taste. That's why I recommend doing clarification only as a last resort. At the final stage the wine is bottled and tightly sealed with corks. Homemade wine should be stored horizontally in a cool dry place (43-54F° / 6-8°C). The temperature can be even lower, but it's important that the beverage doesn't get frozen, because then it will lose its taste, and thawing won't help.